Refer to CAM Reg 200-4 for regulation pertaining to general outdoor recreation. Below are current non-consumptive outdoor recreation activities currently available through the Fort Campbell iSportsman Portal. 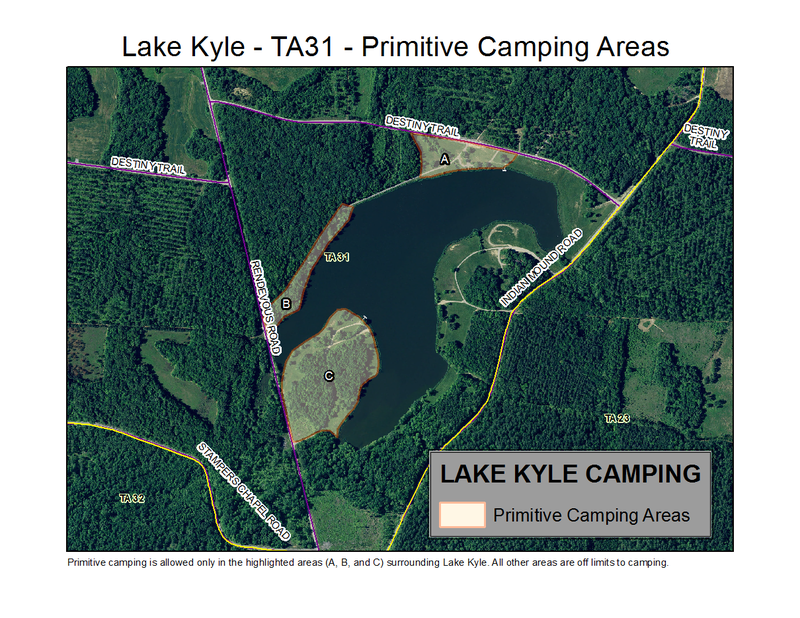 Primitive camping is authorized ONLY in designated areas adjacent to Lake Kyle. Individuals wishing to camp at Lake Kyle must checkin at Bldg. 6645 101st Airborne Division Road. Make note of current business hours on our homepage prior to planning a camping trip. To download map below click here. For information Individuals wishing to participate in any non-consumptive activity in any of Fort Campbell's rear area must obtain a General Recreation Permit and check-in and check-out of "General Outdoor Recreation" areas using iSportsman. Click here to get started. Hiking, Biking, Boating, and Wildlife Observation are the only permitted activities authorized under General Outdoor Recreation permits. Individuals must maintain appropriate permit and area assignment (checkin pass) on their person while recreating. Additionally, an area assignment must be properly displayed in vehicle dash in a manner that allows Law Enforcement and other officials to view. All cyclists must check in to iSportsman Portal. Select General Recreation, "Rear Area Cycling", and be sure to have your area assignment on your person while in rear area. Please see all regulations pertaining to cycling in rear area in CAM Circular 200-4 Section 4-6.